We offer turn-key solutions and can install piping in any location and configuration. Our most common installation uses black pipe. It is by far the best solution for small operations, 8hrs/5 days a week, less than 500 feet of pipe or less than 15 horse power compressors. As the systems get bigger it becomes more and more ineffecient to use. The most common piping system is black pipe because of cost, it is relatively inexpensive. However, in large systems the main cost is not material but labour and black pipe is labour intensive. Also, remember the major ongoing cost of any compressed air system is energy (from 75%- 80%). The other choices are galvanized pipe, cooper pipe and aluminum pipe. The only option that makes sense in large applications is aluminum (we sell Transair Aluminum Piping). 1) It does not leak ! 2) It does not corrode ! 5) Smoother inner surface and bends resulting in less air turbulence and restriction. This could allow a lower compressor pressure set point. A 20 PSI reduction in pressure leads to a 10% savings in energy. Centrair Air Systems is a proud supplier of Transair (by Parker) aluminum compressed air piping. If you are in the market for aluminum piping we encourage you to do your research. There are other manufacturers of aluminum piping, and from our experience in the field, Transair is a superior product. We have seen other manufacturers fitting leak after short periods of time, with Transair that simply doesn’t happen. Transair aluminum compressed air piping ranges in size from 7/8″ to 6″. It is light weight and even at 6″ one person can easily handle a 10′ length. All piping systems leak. This is an ongoing cost in power. It is estimated (U.S. Department of Energy) that as much as 30% of your compressor’s output is wasted due to leaks. A compressor costs about $1 for every Hourse Power every 8 hours. Even a small plant running 40hrs a week with a 10HP compressor will spend (10 x 260 = $2600 * .3) $780 a year because of air leaks. This cost will vary based on pressure (the higher the pressure, the more volume of air lost through the leaks) and length of the piping systems. The Transair aluminum compressed air piping system does not leak. Leaks occur at connection points – connections, Tees, 90’s. Transair engineered connections use the pressure in the lines help seal the connection onto the pipe. They can easily claim zero loss in air leaks. Compare that to Black pipe which starts out with 3% leaks and only gets worse over time. This is what corrosion looks like inside of black pipe, the standard pipe for compressed air in most industrial applications. This corrosion impedes flow and creates turbulence. Both of these create a loss is pressure. This means the compressor has to work harder to maintain minimum system pressure. In other words it takes more electricity to run your compressor as your black pipe system ages. This loss can be considerable. This corrosion also adds to dirty air problems. The air carries the rust into your filters, regulators, tools, etc . . . Which leads to failure, equipment breakdown, and ultimately replacement. The Transair aluminum compressed air piping system does not corrode. The Transair aluminum compressed air piping system takes 1/10 the labour to install compared to black pipe. 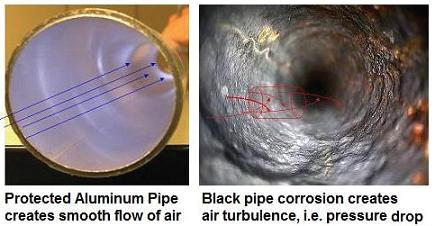 Black pipe requires expertise, Transair requires no in depth training, the pipes are light weight (~1/4 the weight of black pipe), easy to assemble, and the pipe & connections are all reusable – installation does not destroy the connection, both pipe and fitting can be moved or repositioned. All systems need to be changes periodically, with black pipe this usually means adding on pipe runs. What you get in most older industrial sites is commonly referred to as an octopus. With Transair you can easily and quickly move and reposition air lines, rather than adding on and on and on leading to octopus configurations that waste money in pressure drops and can not be easily traced to find leaks or blockages. We are also able to provide after-market parts for some compressor parts saving you money! If there is an after-market replacement that is equal or better in quality and we recommend it. You can trust that we will stand behind it!